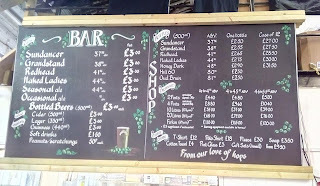 Yesterday's visit to Twickenham Fine Ales was a very welcome chance to catch up with one of my four excellent local breweries (the others are Weird Beard, the new Kew Brewery and of course Fuller's). The weather was pretty chilly – both outside the brewery and inside! – but the welcome from head brewer Stuart Medcalf, managing director Steve Brown and their colleagues was as warm as ever. They had prepared a couple of treats for our small group – a CAMRA delegation mostly from the London tasting panel, which helps write tasting notes for the Good Beer Guide and elsewhere. The first was the very last cask of their 2015 Small Batch Stout series, which proved such a hit last December. They produced 200 firkins of this beer in total, 50 in each of four different flavours, and Stuart said they were sold out before they'd even been brewed, with many pubs buying sets of all four. The lone survivor is the Sour Cherry & Chocolate variant (left). It's delicious – almost a dry stout and full of roastiness, yet also with lots of dark cocoa notes and a faint underlying sweetness. None of us could detect more than a vague hint of sour cherries though! If you'd like to try it, it should still be on sale from the brewery this coming weekend, either for takeaways or when the bar's open on Sunday lunchtime ahead of the rugby. 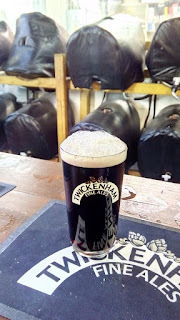 The small batch series was in addition to Twickenham's four regular ales, four seasonals, twelve monthly cask specials – Stuart noted that the latter sell out every time, often on the day they're released – and its sole keg beer, Tusk IPA. Steve said they will brew the stouts again this year, probably keeping two of the flavours and asking their customers to suggest two new ones, just as they did last year. 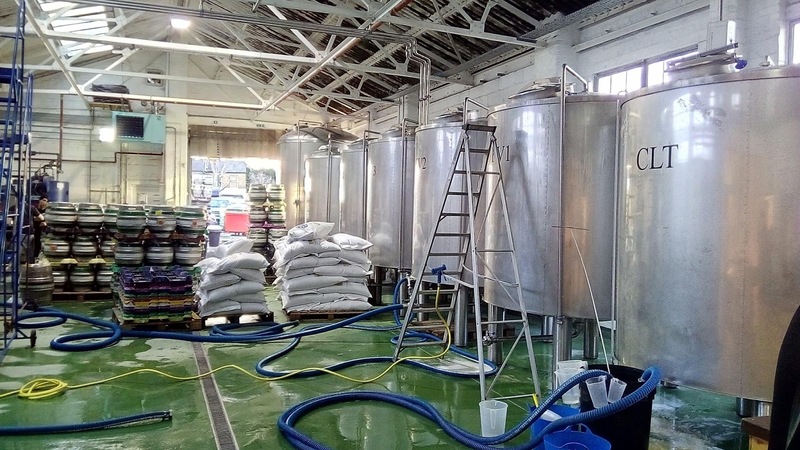 They're also looking at doing extra monthly specials to meet demand, and at brewing more strong beers, mainly for bottling and in 330ml bottles rather than the 500s they currently use. In the meantime, we caught up on existing developments. There's new hardware, in the shape of an automated cask racking line, plus a 50-barrel fermenter alongside the 25s so they can double-brew the most popular beers. There's two new assistant brewers, and there's the main reason for our visit, which is a switch to using their own wet yeast instead of commercial dried yeast. While wet yeast does require extra care and management, and must be renewed from the yeast bank every three months, the fact that the rest of the time they can harvest and re-use it means that it is much cheaper than dried. More importantly to the brewers though, it has improved the beer's clarity and brought out the flavours of the ingredients. “Our beers were clear before, but they shine now,” enthused Dave, Stuart's deputy. I think he's right. Stuart also discussed several other ingredient changes. Interestingly, when it's just had its 50th anniversary, they've stopped using Maris Otter barley and switched to the increasingly popular Flagon variety which he says gives better extract levels (i.e. more fermentable sugars). 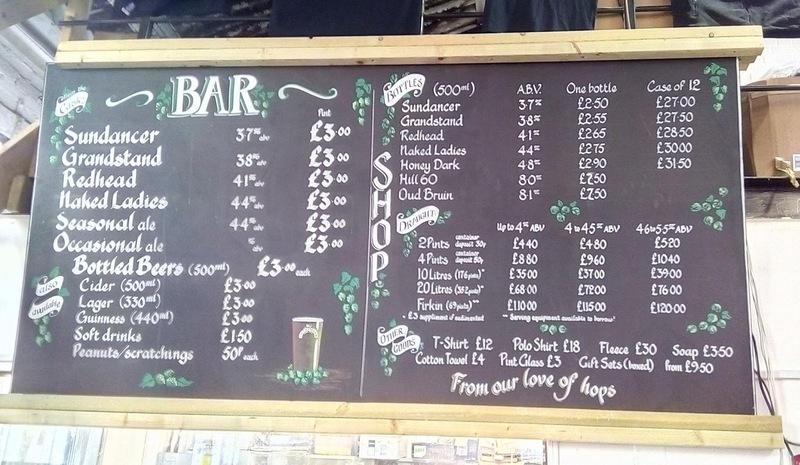 Some of the beer recipes have been tweaked too, and they've changed some of the hop varieties. In particular, they're making quite a bit of use of Progress and Pioneer hops – I especially liked the subtle bitter-orange and peach notes they gave to our other special treat, which was a saved-up cask of Winter Warmer, their monthly special for December. I was surprised though to see that the Winter Warmer – which originally had the very appropriate name of Strong & Dark – is now amber coloured rather than dark brown. Dave explained that, in part to cut confusion with their December-February seasonal Winter Cheer, which is both dark and very lightly spiced, Winter Warmer has been reformulated as an Extra Special Bitter. The result is still 5.2% but now balances a very firm bitterness with a smooth dry-sweet and lightly orange-caramel body. 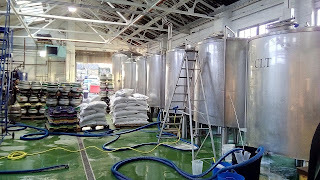 Changing the yeast,malt and some of the hops.Then tweaking the recipes.They cant be the same beers.Only the water has stayed the same.What next a name change.Oh I have seen they have done that already with Hornet and Strong and Dark.Did no-one at Camra mention this to the owner? As Tom says, things change all the time. Usually they're small things to keep the beer consistent - a particular hop's not available this year, so you use another, or this year's barley crop is a bit different so you adjust the mash schedule. Other times they're to track changes in public taste - make a beer a little hoppier or a little sweeter, say - or simply to improve quality. Most of the time, especially with beers made once a year, my experience is that people (even beer geeks) don't really notice until it's pointed out to them. What an unusual comment jocko. Things change all the time. Are you saying things have changed for the worse? The TFA beers I had the last time I was in Twickenham were very good.